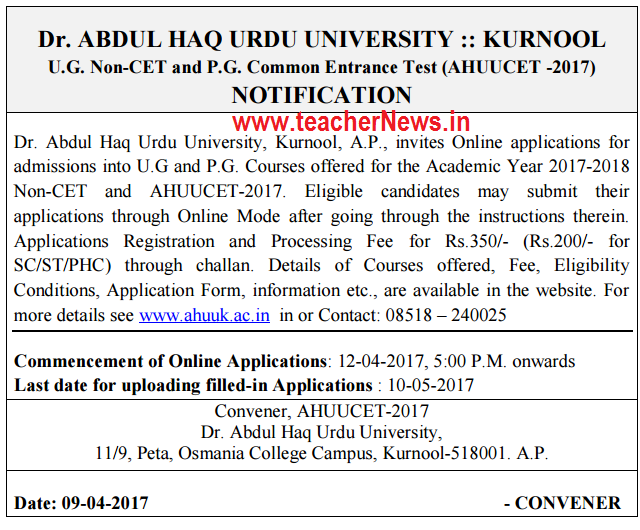 AHUUCET 2017 Kurnool Urdu University Degree PG Admission Notification at ahuuk.ac.in. Kurnool Urdu PG Admission Online Apply, AP Urdu University Degree Admission CET Notification 2017, Abdul Haq Urdu University invites online applications for admissions into U.G and P.G. Courses offered for the Academic Year 2017-2018 Non CET Under Graduate Honors Courses (Non-CET) and Post Graduate Common Entrance Test AHUUCET-2017. Dr.Abdul Haq Urdu University Admissions 2017-18 into AHUU PGECET, UGCET, PG , Degree admissions in Urdu medium. Last Date for Submission of Printout of Online Application 10-05-2017. AP Urdu University PG Entrance Test 2017, Eligibility Criteria, PGCET Syllabus, PG Entrance Test Schedule, Hall tickets, PG Courses Free Structure, How to apply online and more details given here. AP Urdu University Kurnool UG PG Admissions 2017-2018 ,AHUU PGCET 2017 Admissions,AHUU UG/Degree Admissions 2017,AP Urdu University Kurnool PG Admissions 2017. Abdul Haq Urdu University, Kurnool (AHUCET 2017-2018) U.G Non-CET/P.G CET 2017 otification/Online Application/Important Scheduled Dates/Elgibility Cretaria and Fee Particules and Online Application Registration at www.ahuuk.ac.in. Under Graduate Courses : B.A/ B.B.A./ B.Com/ B.Sc. Post Graduate : M.A. Urdu M.A. English M.Com. The application should be submitted ONLINE only at the website www.ahuuk.ac.in by registering the name and other details. A Separate registration is required for each Test. No change of subject shall be entertained at any stage. Candidates should ensure uninterrupted power supply and internet connectivity before filling the application and making the payment online. For speedy processing of application, candidates should keep a scanned copy of their latest passport size photo and signature in JPEG/ JPG format only with less than 100KB in size. Last Date for Submission of Online Application : 10-05-2017 at 5.00 P.M.
Kurnool Urdu Degree Admission Notification, AP Urdu University PG Online application Form Apply, Dr.Abdul Haq Urdu University Degree PG Admissions Online Application form 2017-18 at ahuuk.ac.in, AHUU CET 2017 Eligibility Criteria, Hall tickets, Results at www.ahuukac.in.